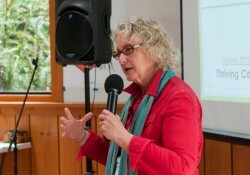 Our partner, Bonny Meyer, was featured again for her activity in the impact investing community. Read more about her inspiring past, present, and future here! 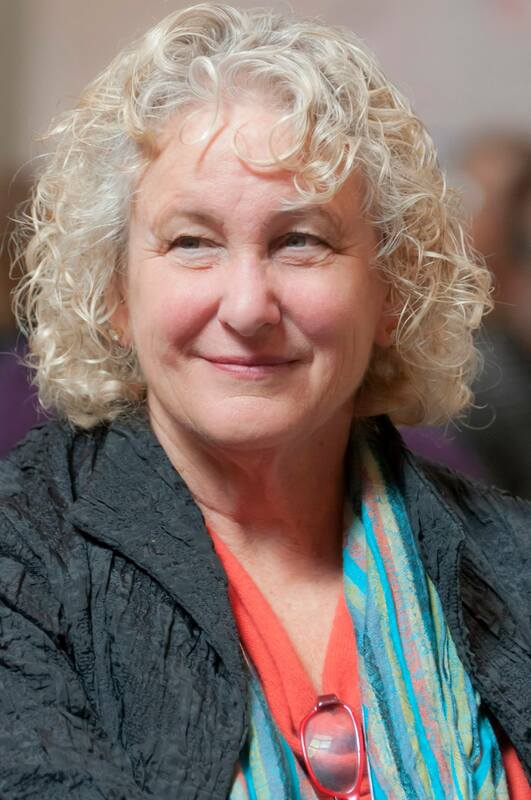 Forbes recently featured our Co-Founder and Partner, Bonny Meyer, for her leading role in the Impact Investment community. “Double Duty Dollars” gives a brief history of Impact Investing and highlights Bonny’s commitment to contributing to the larger good. According to Forbes, at the end of 2014, $60 billion was committed to impact investments worldwide, and the numbers are growing steadily. Learn more about Impact Investing and Bonny here. If he were alive today, Teilard might tailor his truth to better fit a more self-centered culture into something like: “Do something good for yourself AND good for the community.” If so, he would be describing the fundamental mission beyond Napa’s Thriving Communities (www.thrivingcommunities.com). Yet Thriving Communities, with it’s prototypes of two, different affordable and sustainable communities— the pocket neighborhood of Harvest Village, and the 48-unit multi-family development called Napa Creek Village—is itself part of something far bigger than a few local developments of sustainable workforce housing—although the need for such housing is acute in the Napa Valley. Last month, the Whidbey Institute, convened a special three-day conference entitled, “Thriving Communities 2015: Lens on Shelter.” Some 85 community leaders, including Napa’s own Thriving Communities Founder Bonny Meyer, participated in work-meetings which took place on magnificent Whidbey Island out in Puget Sound, off the coast of Everett, Washington. The Institute’s location itself symbolizes interconnection and environmental sensitivity, being situated on the first of a series of Islands that lays out a geological pathway from the Northwestern United States, up through the San Juan Islands, and up to British Columbia, across one of the most pristine land and sea routes in the Western Hemisphere. Over the years, the Whidbey Institute has been home to “bold seekers of positive change, connecting people doing uncommon work, for the common good.” This was the greenhouse that nurtured the early “seed-thought” of Thriving Communities into the reality of affordable/sustainable housing, now taking shape in the Napa Valley. That last goal was not made up by Napa’s Thriving Communities building partner Healthy Buildings USA (www.hbusa.net) , which has been leading the way in California for decades with such “beyond Green,” technologies. It was arrived at by consensus by housing leaders, builders and designers from around the world, focusing their collective “lens” on the best kind of shelter, and communities to build. Fortunately for the people of the Napa Valley, both Thriving Communities Napa (www.thrivingcommunities.com) and Healthy Buildings (www.hbusa.net) are already turning these dreams into reality. On Tuesday, April 21st, Napa Creek Village got a unanimous vote of approval from the City Council. This is a huge milestone for us, and we are now looking forward to the next phase of the project. Along with this, we were pleasantly surprised by yet another front page article in the Napa Register. To read that article, click here. 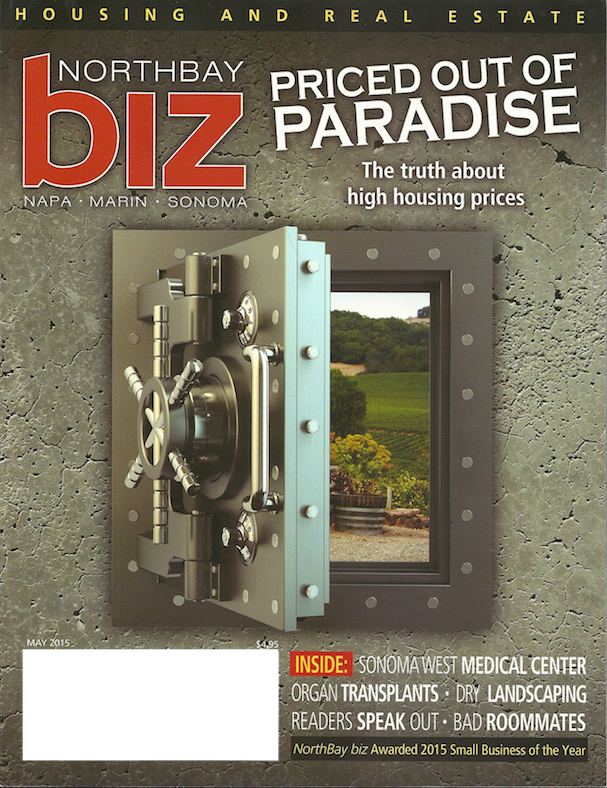 Napa Creek Village was also featured in the NorthBay Biz magazine’s May issue, which focused on housing and real estate in Sonoma, Marin, and Napa counties. You can read the article below. The historic and mandatory California drought restrictions imposed by Gov. Jerry Brown early this month have heralded a new era of limits for many Californians, impacting everything about the way we live. Well, Governor Brown only has to look to Napa County to see a prototype for “learning” to live in a new type of community – a thriving community – and it’s not a few years off, but it’s here NOW.(www.thrivingcommunities.com). Working in tandem with the greenest of environmentally sensitive builders, Healthy Buildings USA (www.hbusa.net) – which has a decades-long record of building some of the most sustainable residences, commercial buildings and dormitories throughout the state of California – Thriving Communities has for the past several years anticipated this moment: when diminishing natural resources would point the way to living in a new, sustainable, and economically viable community, where neighbors become neighbors once again. Using all recycled materials in its attractively designed, state-of-the-art, environmentally sustainable homes and multi-family units, Thriving Communities is redefining the reality of living in a community. In Harvest Village, a “pocket neighborhood,” and Napa Creek Village, a 48-unit multi-family condo community, Thriving Communities & Healthy Buildings USA are going far “beyond green.” Each community will be built for maximum conservation of energy, water and natural resources, by using solar energy to heat and cool each unit, collecting and recycling rainwater, installing a high-tech greywater system, and planting drought resistant landscaping. 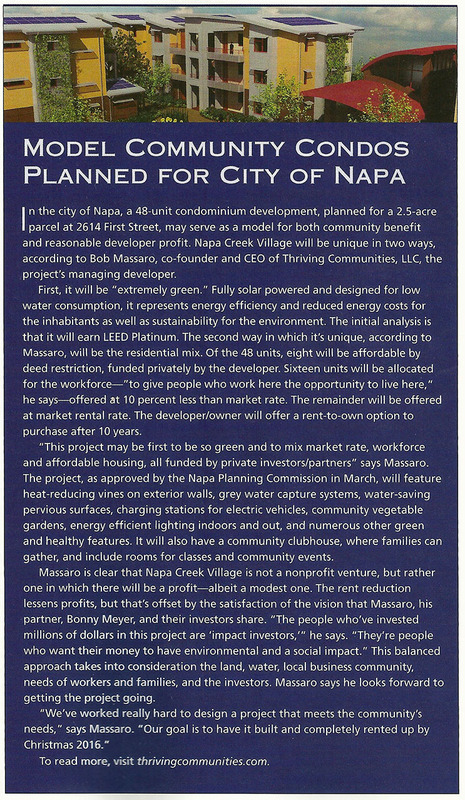 Additionally, it is projected that 127,000 gallons of water will be saved each year at Napa Creek Village alone, over conventional construction and community design. The time for building homes and multi-family units the old, conventional stick-built way is over. Adjustments, like these, must be made. Thriving Communities also envisions workforce housing for people who work and live in the same geographic area, reducing over-dependency on long commutes to get to work, and reducing carbon air pollution generated by automobiles still running on conventional fuel. It’s one way to deal with the negative environmental effects of some of the 32 million cars that Governor Brown mentioned above. The Net Zero Energy units will be environmentally healthy on the inside as well, with no formaldehyde, PVC’s, or volatile organic components used in any construction material. That, combined with a tight building envelope with insulation standards that far exceed state standards, ensure these projects will have the healthiest indoor air quality possible. Additionally, Thriving Communities are intentionally designed to maximize the positive health benefits of living in a real, working community, where neighbors share common facilities, have ample access to open spaces and community gardens, and look out for each other. The positive personal health benefits of living in such a community have been well documented in medical studies, most famously the “Roseto Effect,” highlighted in a previous Thriving Communities blog (April 6, 2015). At every level and in every way, the prototype for the post-drought blueprint is already here in Napa County, and Thriving Communities is leading the process of “learning to live” in a changing environment, articulated by Governor Brown. For Californians, the future can be found in Napa County, in the simple lessons of our past: of living lives respectful of our limited natural resources, and of each other. It’s the reason Thriving Communities was created. (www.thrivingcommunities.com). Is living in a community good for your health? It’s a question which has gained currency again as an epidemic of loneliness and tiny, isolated living quarters sweeps the nation, fueled by social media’s illusion of connection, and manifested in a growing number of stress-related diseases. Numerous medical studies have underscored the benefits of long-term relationships in nurturing the health of both partners, but the most comprehensive of all the “healthy communities” studies dates back some 50 years. The study, entitled “The Roseto Effect,: A 50-Year Comparison of Mortality Rates” and written up in the American Journal of Public Health in August, 1992, is a longitudinal look at how this closely knit, caring community experienced a documented, decades-long reduced rate of heart disease and other stress related illnesses regardless of their diet and exercise patterns. It is meticulously measured medical proof of the health benefits of living in a thriving community over two generations. Roseto, Pennsylvania, settled by Italian immigrants from Southern Italy in 1882, was a closely knit community which emphasized family cohesion and intergenerational support. The study, conducted by a team headed by Dr. Stewart Wolf, the Chairman of Medicine at the University of Oklahoma, and affirmed by major universities and medical journals in the United States and abroad, demonstrated conclusively that a socially cohesive community, where elders were revered and people were nurtured by others, recorded heart & stress related diseases far below the national average and the averages of neighboring towns, without such connection among community members. Like a goal of Thriving Communities (www.thrivingcommunities.com), the culture of cooperation prevailed, “ and radiated a kind of joyous team spirit as they celebrated festivals and family landmarks” together. “People are nourished by other people,” Dr. Wolf found. Is living in a thriving, nurturing community good for your health? The evidence is clear, long-established and well-documented: Thriving Communities work for people’s well-being. Learn more about ours at www.thrivingcommunities.com. We are the keepers of the earth. Whether we recognize it or not, we have each been given a great gift, and a precious responsibility. John Muir said it best, “When we try to pick out anything by itself we find that it is bound fast by a thousand invisible cords that cannot be broken, to everything in the universe”. When we began Thriving Communities in 2014—after some three decades of working in the fields of building healthy housing, sustainability and social impact investing—we were taking what we had previously developed to the next level. Thriving Communities was born out of a vision to bring together high performance building technologies, with the latest advances in sustainable living, at affordable prices for working families, within site designs that create connected communities. 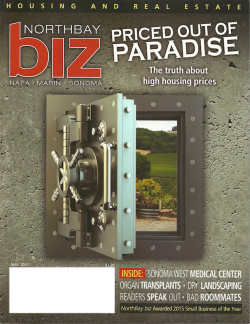 While Green Building strides have been made in commercial buildings and in luxury homes, little attention or resources have been committed to building affordable, sustainable communities. Thriving Communities was founded on the fundamental truth that all people, regardless of income or social status, deserve healthy, beautiful, net-zero energy homes where they feel safe. Since most of us spend most of our lives in our homes, what better way to have a profoundly positive impact on Climate Change than to dramatically change the way we build our homes and communities and to make them affordable to families living on a modest income. And, what better way to cultivate a sense of community by doing all we could to “step lightly on the earth,” and bring the most advanced environmental technology into our new neighborhoods. Thriving Communities new blog, entitled “CONNECTIONS”, is emerging this week, after a long winter of growth and nourishment. Through it, and across all social media, we will tell our story and the stories of individuals and communities dedicated to improving living conditions on this earth for our children, grandchildren, and generations to come. Our objectives of building thriving, sustainable communities are consistent with the United States Department of Health & Human Services “Healthy People 2020” goals of improving public health, improving environmental quality, strengthening economic development, as well as building supportive communities for children and families. We envision our Thriving Communities to be economically viable, environmentally sustainable, and socially healthy and resilient. Through the vehicle of our blog, we’ll be striving to educate our readers on how to improve the quality of their lives, how to build better communities, healthier ecosystems and how to improve economic security. Through the work of Thriving Communities we will strive to accomplish those goals, and to build a better, greener world. We invite you to join us for the journey. 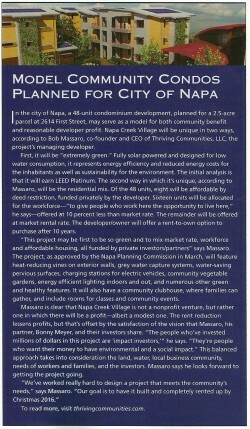 City Planners give Thumbs Up to Napa Creek Village! You can click here to view the full article. This is the first step in a long journey, but it is an important one and we are all very happy for this victory. Our next step is to present to the City Council on April 21st. Constructing internally “healthy” and environmentally sound buildings and communities, has been the hallmark of Healthy Buildings for 33 years, (hbusa.net) and is the reason for the creation of Thriving Communities two years ago (www.thrivingcommunities.com). CBS News “60 Minutes”, in a recent story by Anderson Cooper about the dangerously high levels of formaldehyde used in Chinese manufactured laminate flooring, has dramatically driven home the urgent need to build homes and communities with the healthiest, most environmentally sustainable materials. Healthy Buildings, the sister-company constructing the unique Thriving Communities in Napa County, CA., developed a “Periodic Table of Sustainable Elements” to underscore its paramount commitment to indoor air quality and environmental purity. Several key elements of the table of “Sustainable Elements” explicitly prohibit the use of formaldehyde in any elements of construction or interior design, such as flooring; prohibit the use of PVCs; and prohibit the usage of volatile organic compounds. None of these extra-ordinarily high building standards—which far exceed California environmental and building standards and CARB (California Air Resources Board) designations—were accidental. They’ve been at the core of Healthy Buildings existence, since the company was started by CEO Bob Massaro, one of the few construction executives in the United States with an MPH in Public Health, and solid public health administrative experience in a teaching hospital. Bob came to his passion for indoor air quality professionally and personally, when his then 10-year old son developed asthma from chemicals used inside a house he purchased. From that moment on, Bob pledged to only build homes free of any chemicals harmful to human health. That’s what the communities at Harvest Village and Napa Creek Village in the Napa Valley are all about (see www.thrivingcommunities.com). In the “60 Minutes” story on the health-threatening levels of formaldehyde used in hundreds of millions of square feet of laminate flooring in the US, Dr. Philip Landrigan, the Dean for Global Health at Mt. Sinai Medical Center in New York, and a former Senior Advisor to the EPA, sounds remarkably similar to Bob Massaro. Dr. Landrigan, whose lifetime of research has focused on toxic chemicals in the environment, called the formaldehyde-tainted floors “not at a safe level”, noting that they constituted “unsafe indoor air quality:” precisely the same mantra Massaro has been repeating for decades. At Healthy Buildings and Thriving Communities, “NO Formaldehyde” is an article a faith, and it’s at the foundation of our buildings our corporate culture. We think you’ll agree that the mission of Healthy Buildings and Thriving Communities to “improve lives of people while protecting the environment,” is the only sensible one to apply to building a new home or community, for maximum health and safety of the residents. If there’s another organization in the country that builds safe, healthy, sustainable homes and has the toughest standards of 44 Sustainable Elements to guide its work, we’d like to learn of it. If not, we’d like to introduce ourselves to you, and demonstrate that we are the healthiest, most affordable, community-centric alternative out there for building homes in which the air quality is actually good for your health. Check out our table of 44 Sustainable Elements at www.hbusa.net.